Planned by George Quellet, in 1960. This extraordinary little studio machine was a wonder of the studios. All the Quellet’s machines are contain many special, and interest accomplishments. George Quellet has planned all the Stellavox machines himself. 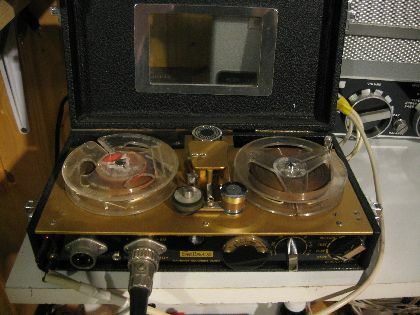 The most famous tape recorder was the Stellavox SP7, and SP8. The products made in Switzerland are famous for the exactitude and reliability. It is true, not for only the watches, but for the manufactoring of tape recorders too. There are three world-famous firms in Switzerland: Studer (Revox), Nagra and Stellavox. There are the evidences of the high quality.